This is not a traditional aïoli, which is all about a large quantity of garlic pounded to a paste and emulsified with olive oil. Rather, I have toned down the garlic, omitted the bread, and increased the amount of lemon juice. The result, I think, is one that’s more contemporary in use and taste. It’s lighter but still garlicky and tart enough to add character to sandwiches, salads, or to use as a condiment sauce for grilled or poached meats, fishes, and vegetables. Whisk the garlic paste, salt, egg yolks, and 3 tsp. of the lemon juice in a heavy bowl until the mixture is light and creamy. Using a fast back-and-forth motion, gradually whisk the oils into the yolk drop by drop. Increase oil to a thin stream and continue whisking until you have incorporated all the oil. If the aïoli it too thick, whisk in the warm water to thin. Stir in the remaining lemon juice, and add black pepper to taste. Adjust seasonings. 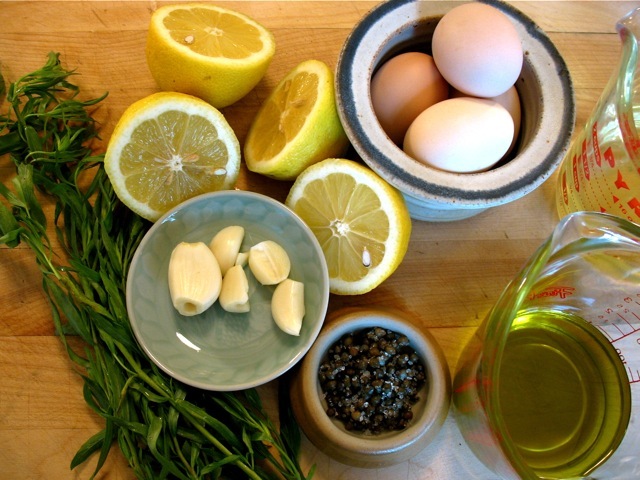 If your eggs are not large, reduce the amount of oil to about 1 to 1¼ cups total. The aïoli will keep in the refrigerator for four days. Kelly Myers elaborates on making aïoli and mayonnaise in her [/columns/frontburner/aioliversus_mayonnaise "June 2008"] Front Burner column.